How hard is it to brew beer at home? Not hard at all, just follow simple instructions and take your time. Beer is made from malt, water, hops, and yeast. The malt and water are brought to a boil, hops are added, the "wort" (unfermented beer) is cooled, and yeast is added to cause fermentation. Other ingredients are common in brewing, such as fruit, spices, grains other than the standard barley (such as wheat, rye, and oats), honey, sugar, and anything else that you'd consider ingesting. Basic equipment includes a kettle for boiling the wort, a fermentation vessel of some kind -- glass carboys (5 gallon bottled water bottles) and food-grade plastic buckets are popular -- siphon hose for bottling, bottles, and a bottle capper and caps. I'm interested in brewing my own beer. How do I start? Is there a homebrew club in my town? Information on clubs can be obtained from the American Homebrewers Association (see next question for AHA address). In addition, several clubs that have members with e-mail access are listed in a database maintained by Scott Murphy. These members have offered to serve as contacts for their club. To find which clubs are listed or to become listed yourself, send e-mail to Scott (scott@gordian.com). Who/what is/are the AHA and "Zymurgy"? 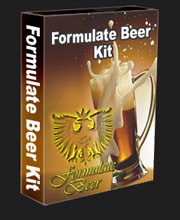 That question is exactly why we came up with the Formulate Beer Kit. It doesn't matter if you have never brewed beer before because the Formulate Beer Kit gives you all the information you need to brew your own beer. With over 640 recipes to choose from you will be able to come up with lots of different beers that you will love, that is if you love beer!